One New Year’s season I was sitting with thousands of college students at the Urbana conference at Illinois University. The arena was packed to the rafters. At one point in the program, they asked us all to pray…out loud. 20,000 students praying at the top of their lungs. I was overwhelmed not just by the noise or the cumulative effect but by the simple fact that God was capable of hearing all the prayers, deciphering the desires, formulating each request, and answering each one perfectly. In my ear, my prayer was the only one I could really hear; all the other prayers were in the background. But for God the Father, every prayer was the only one He could hear. No such thing as background prayers. Every moment of every day, millions of prayers are cast heavenward—He treats each one like the only one. Why? We want you to truly experience Christ's peace! We all face challenges in relationships, finances, health, or other aspects of our personal world. We work so hard to create peace and stability in our lives – yet it often only takes something small or unexpected to devastate it! Yet the Bible teaches that peace is not only possible – it’s what God desires for your life! 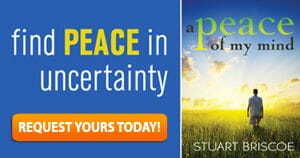 That’s why Stuart Briscoe wants to send you his book, A Peace of My Mind. This special resource is our gift to thank you for generously supporting Telling the Truth, so please request yours when you give a gift below. We trust it will encourage you to experience perfect peace – and thank you for sharing God’s peace through Telling the Truth!